The sweet fragrance of incense drifted across the open-air room, slowly burning inside a Buddhist shrine tucked away in the corner. The faint sound of chickens rustling through the dirt yard filtered in between the distant motorbike traffic on a rural road on the outskirts of Chiang Mai. All around me statues and wall hangings decorated the studio, emblazoned with scripture and teachings in Buddhism. The kaleidoscope of ornaments created a colourful and humbling environment, shrouded in peaceful ambiance. I, however, noticed none of it. I was transfixed in the moment, my eyes closed, all thoughts vacant as the steady tapping of a needle broke the skin on my back. Behind me Ajarn Rung, a master tattoo artist donning the traditional orange robes of a monk, etched the mixed Sanskrit, Khmer, Thai and Burmese characters of a Buddhist mantra onto my shoulder blade. Breathing deeply I focused not on the pain, but on the spiritual episode that I had found myself in, getting my second sak yant in Chiang Mai. The samnak at Ajarn Rung’s house. 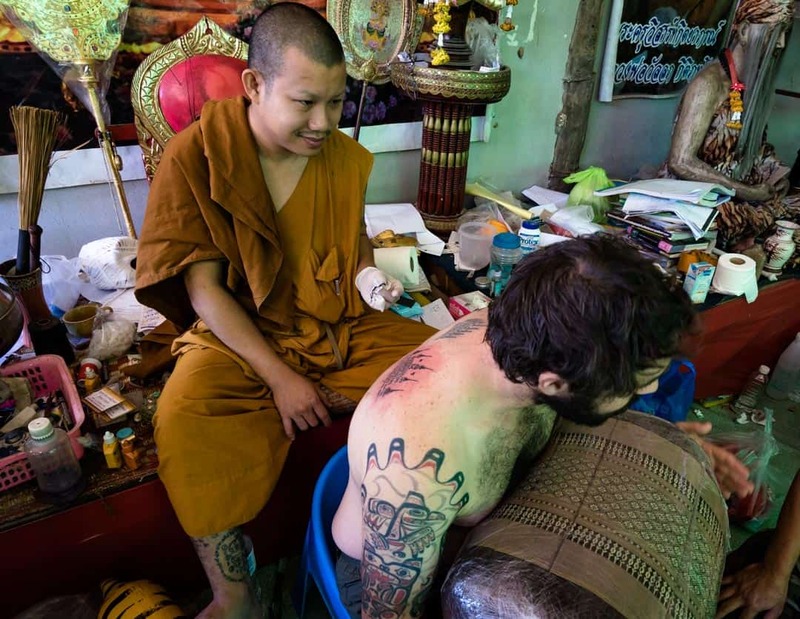 The idea of getting tattooed by a monk has captured the imagination of travellers to Southeast Asia for decades. It has become commonplace to encounter hordes of backpackers on the banana pancake trail sporting these phenomenal “bamboo tattoos”. In 2014 I travelled to Wat Bang Phra, a large temple complex outside of Bangkok, and received a sak yant from the famous Ajarn Luang Pi Nunn. This renowned tattoo master has been inking Thais for years and steadily growing in popularity amongst foreigners. 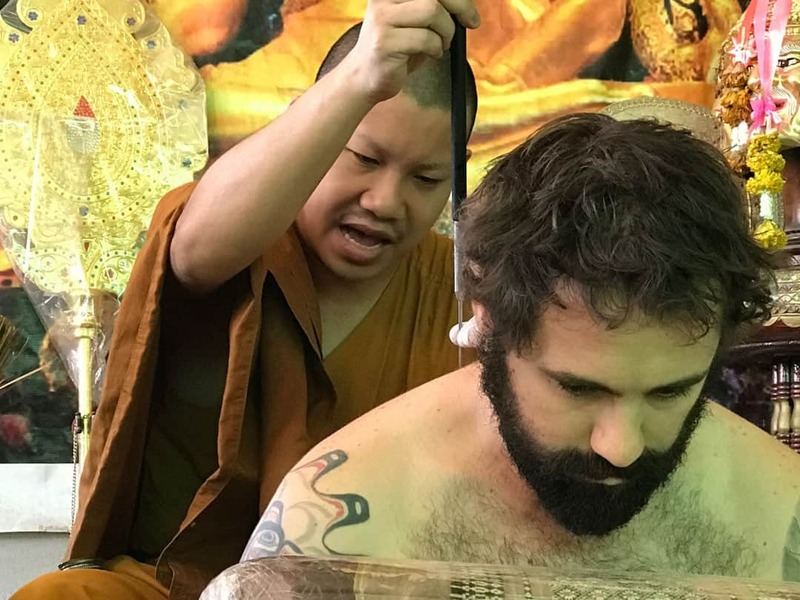 My journey to Wat Bang Phra and the subsequent tattoo I received from Ajarn Luang Pi Nunn was an incredible experience and something I will never forget. Yet with no ability to communicate with him and a lack of understanding from the whole ceremony, I felt like I missed out on a deeper appreciation of what was involved. Giving a blessing before my sak yant. Two and a half years later, after traversing Asia without taking a single flight and exploring some of Europe’s most fascinating sights, Alesha and I found ourselves back in Thailand. Having always used tattoos to immortalise my travel experiences, I was ready to be inked again. My fondness for indigenous and traditional art has lasted for years, and since my first experience had been so amazing, I couldn’t wait to get another sak yant in Chiang Mai. 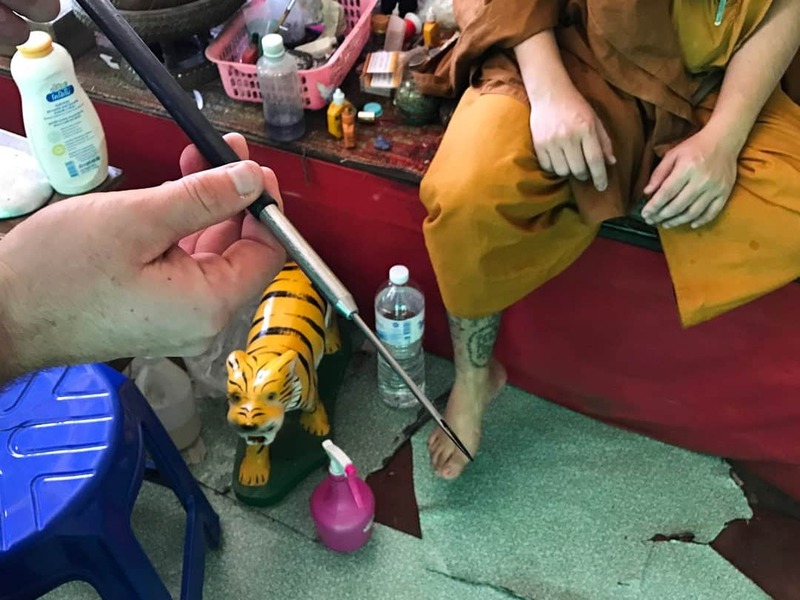 While it’s possible to visit a temple to meet an Ajarn (or “tattoo master”) and pay by donation, in much the same way as Wat Bang Phra, I wanted a bit more substance out of my second sacred ink. This time for my sak yant in Chiang Mai I booked an experience with Where Sidewalks End. 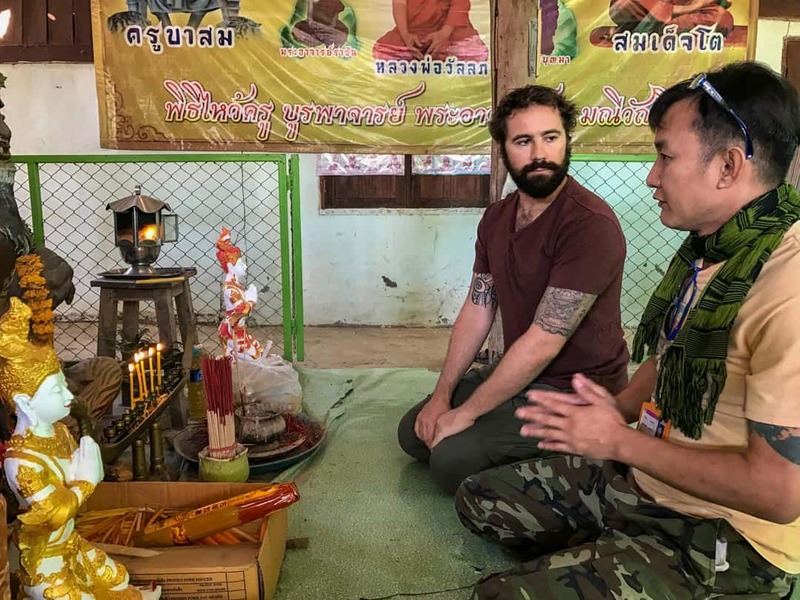 Rather than being left up to my own devices, I would be accompanied by an English-speaking guide who himself had received many sak yants over the years and was very knowledgeable in their history and meaning. After much thought and reflection, I was ready for my sacred tattoo. Learning about the Buddhist blessings from my guide Noi. Alesha and I were picked up from our apartment on the morning of the winter solstice. The date wasn’t random; I had chosen December 21st, 2016 specifically to add to the spiritual element of the day’s experience. Our guide Noi met us with a beaming smile and a warm introduction, before leading us to the waiting car. The driver’s name was Chai, and he was equally enthusiastic about what the day had in store for us. Alesha had decided to opt out of getting another tattoo, but was curious to learn more about this fascinating practice. We made our way out of Chiang Mai, dodging and weaving between the traffic until we reached the outskirts. 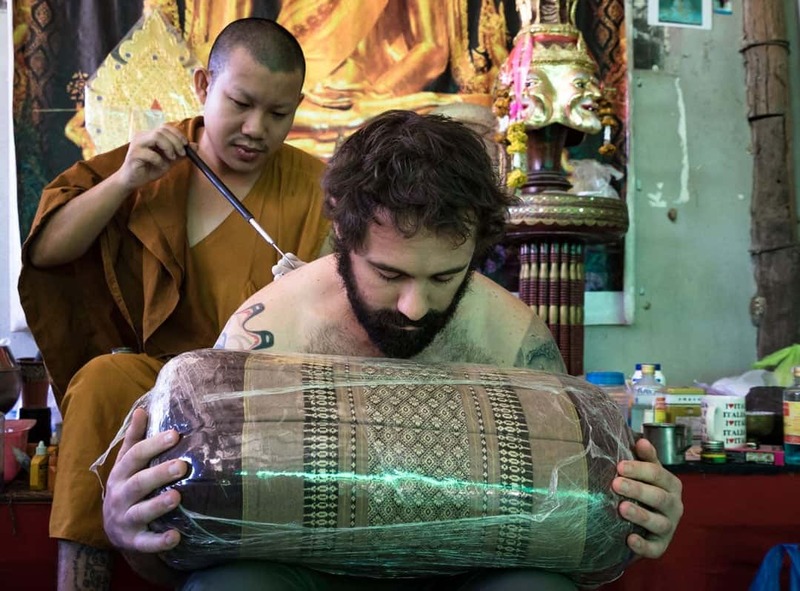 Noi chatted to us about the history of these sacred tattoos, and his own sak yant experiences. The congested city transformed into tranquil countryside and soon we arrived at a large property with modest dwelling. 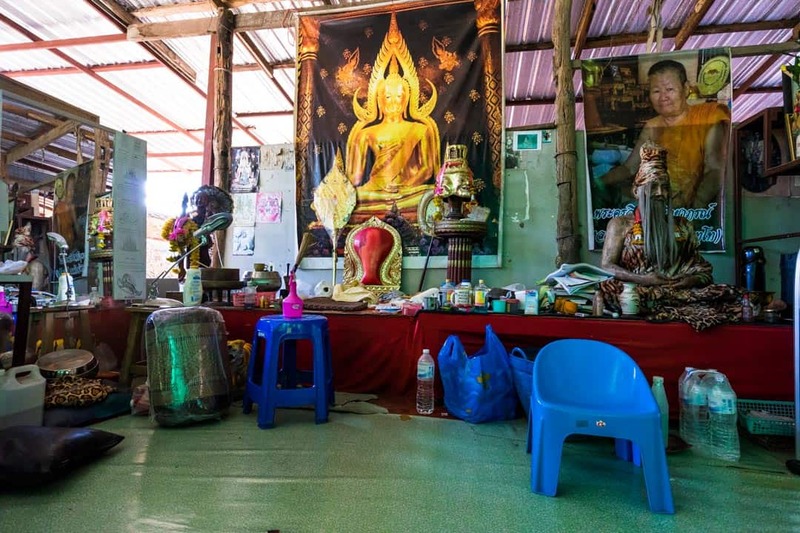 The sak yant would not be given in a temple but instead at a samnak, or tattoo studio, next to the Ajarn’s home. A Buddhist shrine where we gave our blessings. Alesha and I wandered around the grounds, playing with the dogs that roamed freely and greeting a smiling, elderly lady seated at the entrance to the samnak. We later learned she was Ajarn Rung’s ailing mother, and her health was the reason that he was no longer living in a temple. Noi spoke passionately about the origin of sak yants, the various beliefs behind them and many of the common misconceptions. “Sak yant” simply means to tattoo a yantra, the Sanskrit word for a mystical diagram. 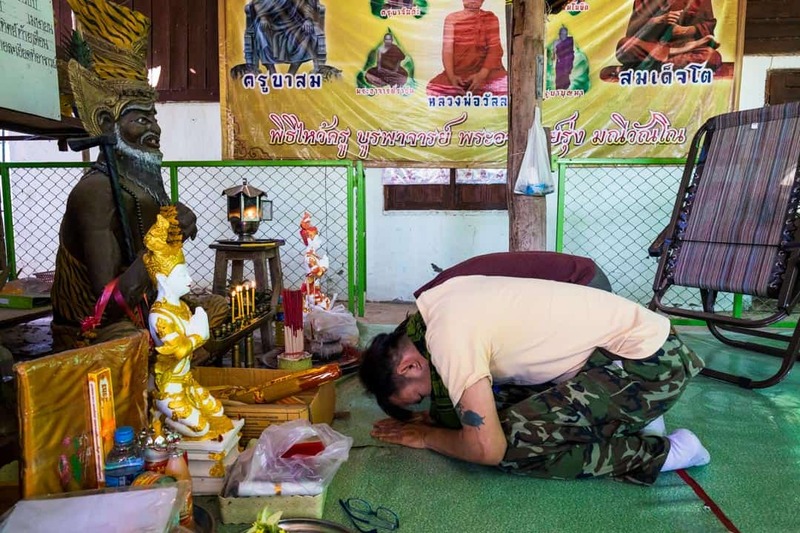 Despite what we had previously heard, it isn’t actually forbidden for an Ajarn to give a sak yant to a woman. It is just their own personal choice. While monks can’t physically touch a lady, they can still give a sak yant by placing some cloth between their hand and the woman’s bare skin. Secondly we were surprised to discover that the person giving the tattoo doesn’t have to be a monk. Ajarn means “master”, and by that the tattooist is someone who has been trained in all elements of sak yants by another tattoo master. That being said most Ajarns have gone through the training to become a monk, which is compulsory in Thailand. Ajarn Rung designing my sak yant. Receiving this training from a master is what differentiates real sak yants and similar pieces given by tattoo artists in a studio. his is why going to any tattoo studio is not the same as going through this whole experience. Soon enough Ajarn Rung came out from his house and greeted us with compassion and kindness. He began lighting incense around the room and conducting his Buddhist blessings. I sat down on the ground of his samnak and waited for further instructions. When Ajarn Rung had finished he took his place on his elevated platform and began preparing the metal rod (khem sak) and ink. Each khem sak is personally made by the Ajarn and has deep sentimental value to them. The ink is also mixed by hand from a number of different products, sometimes reportedly snake venom and human ash. Ajarn Rung chooses to use natural inks found in plants and oils. Before we began I went over to the Buddhist shrine and Noi taught me how to give my blessings to Buddha. I closed my eyes, made my wishes and placed some incense into an urn. I then bowed three times, touching my head to the floor, before moving back to the centre of the room. Flicking through Ajarn Rung’s sak yant book. Noi asked me what I was looking for in a sak yant, and where I was spiritually and mentally. I discussed my travels and plans for the future and Noi translated it to the monk. Ajarn Rung thought for a moment and spoke in Thai to Noi. In front of us were a few books with common sak yants, and Noi started to flick through them with me. He pointed out the ones that Ajarn Rung thought would be suitable for me, however I made it clear that I would prefer to go with the monk’s idea, if he had one for me. I approached the monk, took off my shirt and turned around. 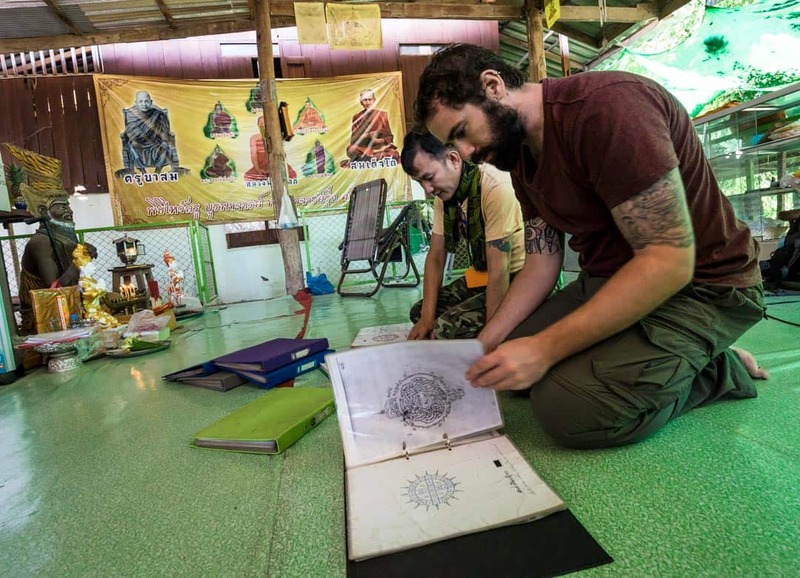 Ajarn Rung studied my previous tattoos, including the one from Wat Bang Phra, and asked about them. When I explained that I had received my other sak yant in Bangkok from Luang Pi Nunn he laughed. Ajarn Rung had himself trained with this legendary master. The monk started drawing up a rough design and in less than a minute he showed me what he had decided would best match what I needed. A simple design that would offer power, mercy and good fortune. I smiled, agreed and prepared myself for the experience. Admiring all the beautiful sak yants. Noi passed me a triangular cushion wrapped in clean plastic and I leaned on it. I took some deep breaths and felt Ajarn Rung’s hand rest on my back. The first tap punctured my skin as I allowed my thoughts to empty and fully embrace the moment. The steady sensation of the khem sak rapidly pushing into my back became like a source of meditation. I kept breathing deeply and the pain soon turned numb, something that I had grown used to after so many tattoos. The feeling was quite different to a machine tattoo; not better or worse, as rather than scratching it is more of single puncture repeating. Occasionally I would open my eyes and Alesha would be smiling back at me. She was in awe at how mesmerising the entire scene was, with the monk deep in concentration as he inked the custom, freehand design onto my back. Lesh stood up to look at the work so far, and simply mouthed the word “wow” to me. Deep in the moment I was surprised when after only 15 minutes or so the tapping stopped and Noi told me Ajarn Rung was finished. He held up a mirror for me to see and asked if I was happy with it. Happy wasn’t the right word – I was ecstatic. Ajarn Rung then asked if I wanted anything extra added to it. With such a kind gesture, I asked if he would add one more line of good fortune to help guide us on our next adventure. He smiled and tattooed a final mantra. 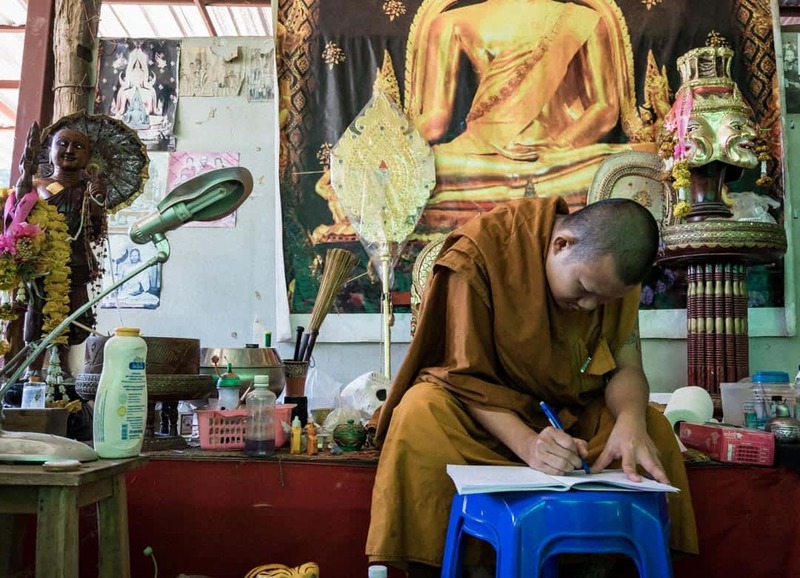 When it was all over Ajarn Rung gave a blessing and blew gently on the ink, embedding the magic and power that sak yants are famous for. I stood up and thanked the monk, then studied my design in the mirror. I was overwhelmed with joy at the intricate lines and special meaning that was now permanently etched onto my back. Ajarn Rung at the end of my sak yant. By now a few locals were waiting patiently for their own sak yants from Ajarn Rung, so we quietly left as he cleaned and prepared his tools for the next person. After the experience Chai drove us to an amulet market. Noi walked around with us, explaining the importance of amulets in Buddhism and what the different symbols meant. He then took us to a local eatery where we had a delicious lunch. Returning to the city we thanked Noi and Chai and they quickly went over the meaning of my sak yant once again, ensuring that I would not forget it. While appreciated, they needn’t have bothered; it was something I would never forget. 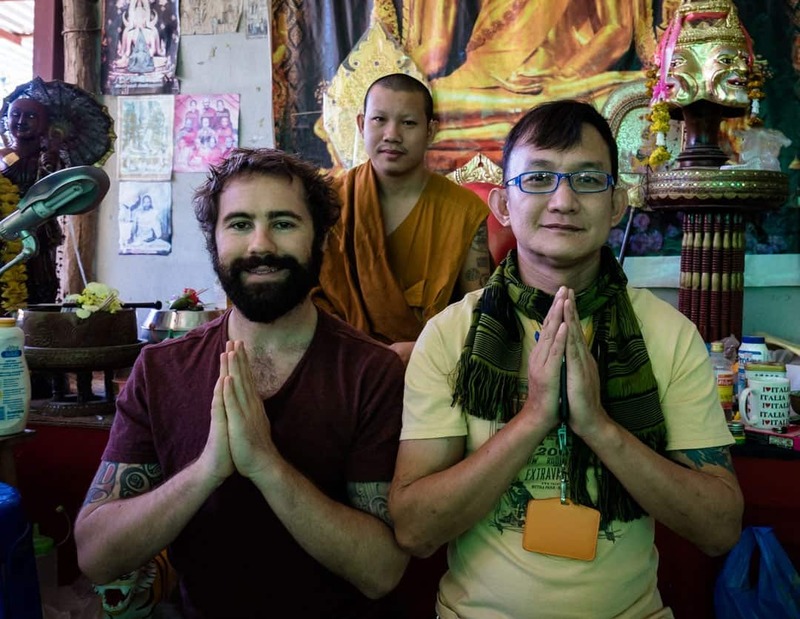 Getting a sak yant in Chiang Mai was one of the most spiritual and powerful experiences throughout my time in Asia. Compared to my first at Wat Bang Phra, it was a much more detailed and rewarding experience. Now being educated with the true meaning of these sacred tattoos and the history behind them left a wondrous appreciation of them. With my new ink providing power, mercy and good fortune for the rest of my life, I will always look back on this as a truly magical moment in my life. Me, Ajarn Rung and Noi. Can A Woman Get A Sak Yant? 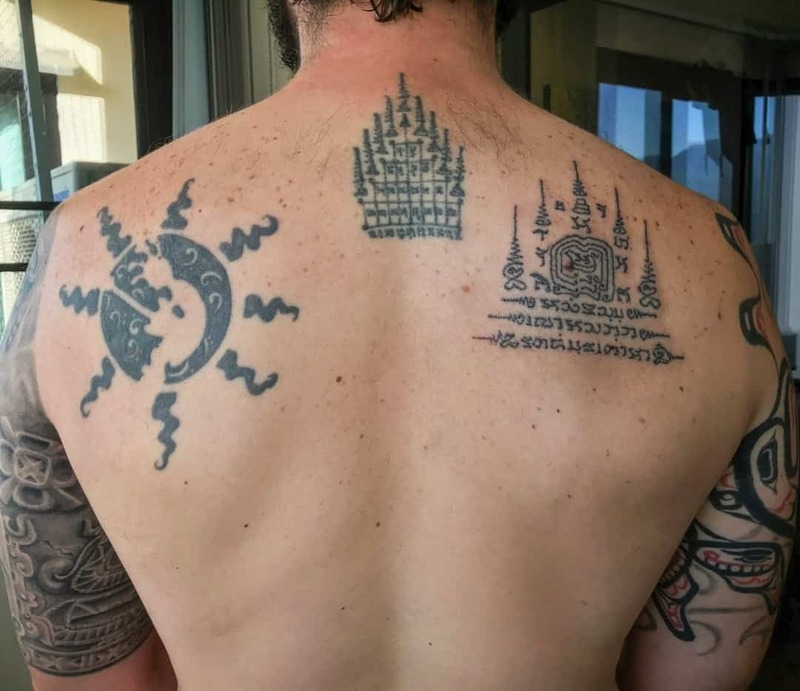 Does The Monk Choose The Design And Placement? Is Getting A Sak Yant Clean/Hygienic? It is possible to simply visit a temple to get your sak yant in Chiang Mai, in much the same way I did at Wat Bang Phra in Bangkok. However you will not be given any context to what the sak yant means, and the cleanliness and quality of work cannot be guaranteed. For this tattoo I went through the tour operator Where Sidewalks End. They aren’t the cheapest option to getting a sak yant in Chiang Mai, however they are the most responsible and provide the most detailed and rewarding experience. 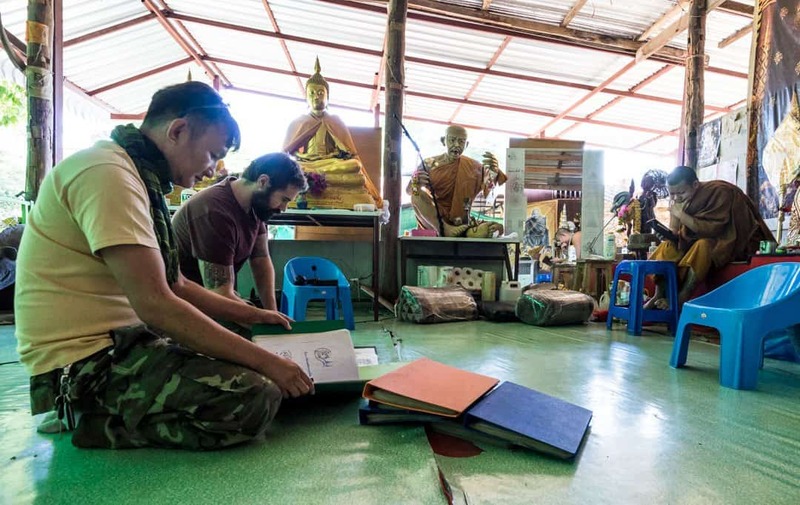 With an English-speaking guide you can ask as many questions as you want about sak yants, their history and what exactly your tattoo will mean. They take care of everything for you so you don’t have to worry about a thing. Where Sidewalks End has also hand chosen Ajarn Rung to be their tattoo master of choice for his incredibly detailed work and commitment to hygiene. They have a strong ethic for sustainable tourism, and ensure that their local guides and drivers are well paid and receive excellent training. Along with their promise of donating additional money to charitable enterprises in Thailand, this makes Where Sidewalks End a fantastic, responsible and safe company to consider your sak yant in Chiang Mai. Ajarn Rung getting into it. This really depends on your pain threshold. Personally I don’t feel a sak yant is any more painful than getting a machine tattoo. One big benefit of a sak yant though is that they heal incredibly fast – often within a few days! This is because they are made up of individual punctures as opposed to the constant tapping and scratching that a machine tattoo does. Technically yes, a woman can get a sak yant tattoo. However this really comes down to each individual Ajarn’s choice. Buddhist monks can’t touch a female, but if they are willing to give a sak yant to them they can simply place a piece of cloth between them so they don’t make physical contact. Ajarn Rung does tattoo women, however he does not allow himself to be photographed giving a tattoo to a woman. One misconception is that the monk reads your “aura” then decides what tattoo to give you and where. This isn’t entirely true. 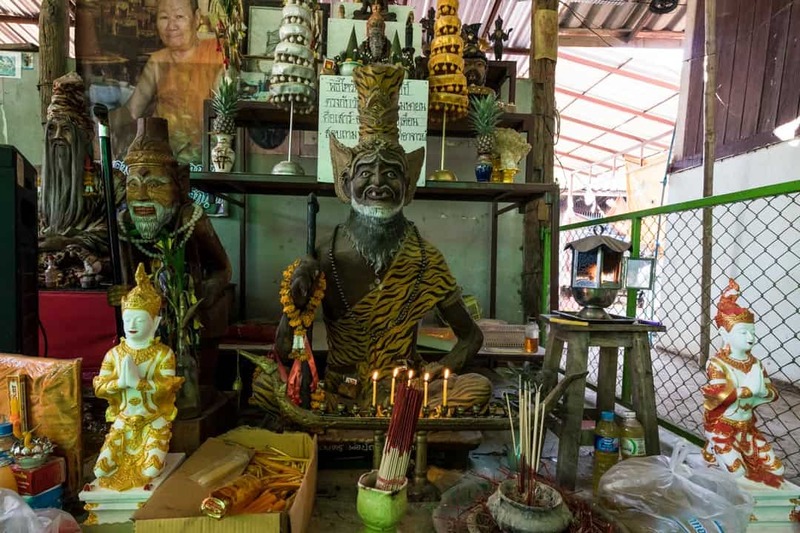 The monk will come up with an idea of what to give you, and often some sak yants should only be placed on certain parts of your body, but he won’t read your aura to decide this. At Wat Bang Phra I had no say or idea of what I would get and where. Ajarn Luang Pi Nunn simply placed a stencil on my back. At this point I could have requested something different, but without speaking Thai it would have been difficult to get my point across without just saying “no”. 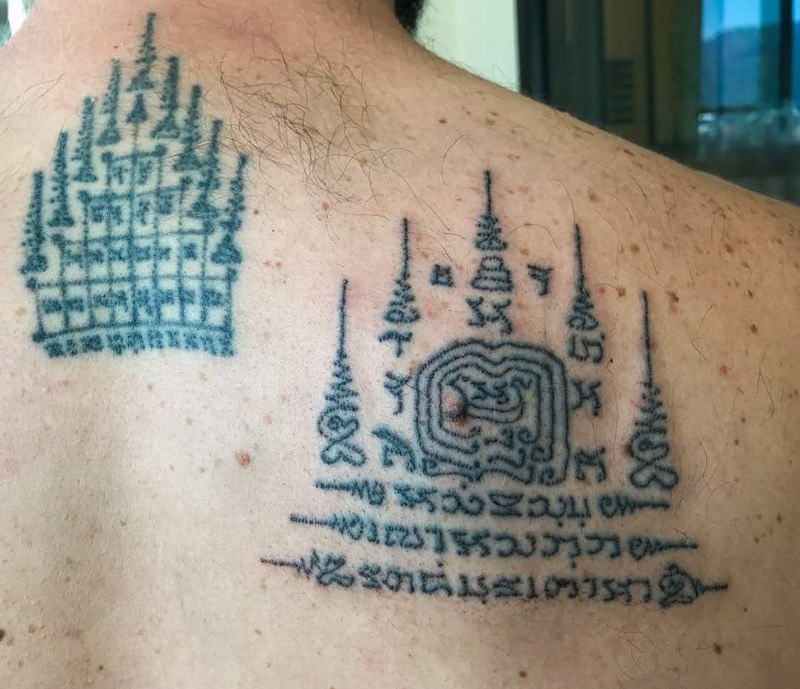 My new sak yant, next to my original piece from Wat Bang Phra. The centre point draws power into my body while the circles around it are for protection and mercy. The lines and mantras above and below it are for good fortune. Because I had an English-speaking guide with me I could request a specific design and placement, and the monk would have told me if it was inappropriate or not suitable. However I decided to let the monk come up with a design and choose where to place it. Ajarn Rung showed me the design and explained the meaning before he started the tattoo. This is often the million-dollar question for people looking to get a sak yant. The truth is that they can either be absolutely fine, or extremely horrible. Wat Bang Phra and similar temples aren’t known for their cleanliness, and this alone puts off many people from getting a sak yant. Some studios offer bamboo tattoos with brand new needles and ink, however these aren’t necessarily sak yants. Ajarn Rung sterilises all his needles between giving tattoos, and uses gloves, but it is in an open environment and there were dogs around. That being said at no point did I feel concerned, and neither did Alesha (who is most definitely the more sensible one in our relationship). My Sak Yant Chiang Mai tattoo experience was provided by Where Sidewalks End. All thoughts, opinions and pain endured is as always my own. My back with my latest ink. It’s an absolute one of a kind experience but wow but it is expensive compared to what you would be in Bangkok in Wat Bang Phra. You paid US$250 for the tattoo? I’m going to Chiang Mai and would love to get a sak yant for my birthday but don;t know if to d it in Chaing Mai or back in Bangkok Wat Bang Pra. Also, where did they take you for the an amulet market? What a great story! Nice tattoos also! I love it! Thanks for sharing! That is a nice tattoo, with an awesome story. Thanks for sharing!